r. Wolfgang Golther is best known to those with an interest in the life and works of Richard Wagner as the editor of the correspondence between Wagner and Mathilde Wesendonk, including the so-called Venice Diary. Subsequently Dr. Golther published two books in which he surveyed Wagner's sources and related literature. One of these concerns the legend of Tristan and Isolde, the other concerns the legend of Parsifal and the Grail: Parzival und der Gral in der Dichtung des Mittelalters und der Neuzeit. The following short extract has been translated from the chapter headed "Richard Wagner's Parsifal". When reading Dr. Golther's attempts to reconstruct the lost 1857 sketch of Parsifal the reader should keep in mind that, although plausible and informed, it is no more than guesswork. 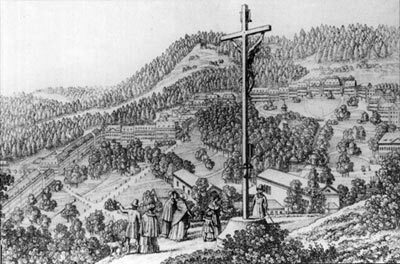 Left: Marienbad seen from the Cross Well, drawn in 1843. Wagner visited this spa in 1845.
so glorious that none on earth can compare. a host of angels brought it to this earth. it does confer on its devoted knights. 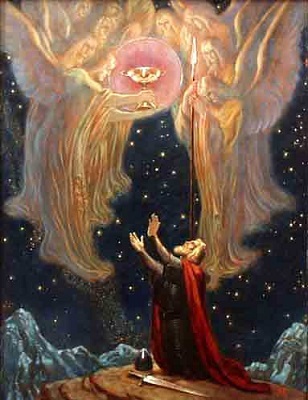 Left: Titurel Receives the Grail and Spear, oil painting by Franz Stassen. he prelude to his Lohengrin, entitled the holy Grail, describes -- according to Wagner's own program note written for the Zurich music festival of 18 May 1853 and later published in volume 5 of the Gesammelte Schriften1-- the Grail borne aloft by a host of angels. The divine vessel is revealed with increasing clarity to the senses of the onlookers as it approaches the earth. The angelic host ascends again and disappears in the bright light of the blue ether from whence it came. But the Grail remains behind in the care of the purest humans, into whose hearts its contents have been poured. Parzival searching for the Grail was to appear at Kareol as a pilgrim, while Tristan lies there on his deathbed, in the depths of despair and love's suffering. So the one desiring, who will find salvation through compassion, and the other renouncing, who curses himself in atonement for his guilt and endures love's suffering unto death, would be seen together. Here death! There new life! It was intended that a melody associated with the wandering Parzival should sound in the ears of the mortally wounded Tristan, as it were the mysteriously faint receding answer to his life-destroying question about the "Why?" of existence. Out of this melody, it may be said, grew the stage-dedicatory festival-drama. Parzival: "Wo find' ich dich, du heil'ger Gral, dich sucht voll Sehnsucht mein Herze". Third act - Tristan on his sickbed in the palace garden. Battlements to the side. Awaking from sleep he calls out to the squire, who is keeping watch on the battlements, asking whether he sees anything. There is nothing to be seen. At his call he comes finally. Reproaches - apology. A pilgrim had to be received. There and then. Tristan's impatience. The squire still sees nothing. Tristan considers. Doubts. Singing receding from below. Who is it? Squire tells of the pilgrim - Parzival. Deep impression. Love and agony. My mother died, when she bore me; now I live, born to die. Why so? - Parzival's refrain - repeated by the shepherd - the whole world nothing but unsatisfied longing! How is it to be stilled? - Parzival's Refrain. Right: In the deep woodlands, lying beside the brook... 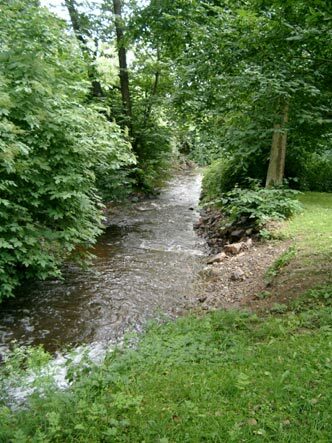 This brook runs through Marienbad. Beautiful spring weather now set in; on Good Friday I awoke to find the sun shining brightly into this house for the first time; the little garden was blooming and the birds singing, and at last I could sit out on the parapeted terrace of the little dwelling and enjoy the longed-for tranquillity that seemed so fraught with promise. Filled with this sentiment, I suddenly said to myself that this was Good Friday and recalled how meaningful this had seemed to me in Wolfram's Parzival. Ever since that stay in Marienbad, where I had conceived Die Meistersinger and Lohengrin, I had not taken another look at that poem; now its ideality came to me in overwhelming form, and from the idea of Good Friday I quickly sketched out an entire drama in three acts. Left: The little dwelling; the "Asyl". A wonderful morning was ascended over lake and mountains of Zürich and its surroundings. The Master looked down from the heights of his newly-won, tranquil "Asyl" into the sunny charms of the spring morning: You are not to carry weapons on the day, when our Lord died on the cross! , he seemed to hear as if from angel tongues in the great peace of this solemn world. It was a far distant voice, a Grail sound resounding from the days of his Lohengrin, a slowly fading memory from the time, when he once had communed, in the Bohemian forest, with Wolfram's poem of Parzival. Before him the picture of the Crucified floated; and, quietly putting aside the armour of philosophically-clarified world-criticism and the weapon of historically- sharpened world-denial, he sketched the poem of his Parzival. he report does not, in fact, agree with the historical data: the Wagners only moved into the "Asyl" on 29 April 1857, while Good Friday fell in 1857 on 10 April, before Wagner had stayed in the "Asyl". The whole account points however to a deeply internal experience, which stuck indelibly in his memory, even if the incidental circumstances became confused. 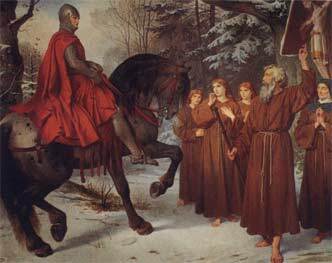 Right: Parzival, riding proud, armed and finely-dressed, meets the grey pilgrim-knight on Good Friday, in this painting from Ludwig's castle of Neuschwanstein. You see it is not so: today all animal creation is glad to gaze up at the Redeemer. Not being able to see Him on the Cross, it gazes up at man redeemed: who, through God's loving sacrifice, has a feeling of holiness and purity; the meadow flowers notice that man does not trample them today, but, as God took pity on mankind, spares them: now all that is blooming and soon to die, gives thanks; it is Nature's day of innocence. undry, as the penitent Magdalen, has her model in Wolfram at the beginning of Book 9 in the anchoress Sigune, whom Parzival visits first. The Zürich draft probably brough together Sigune (i.e. Kundry), the grey pilgrim-knight, Trevrizent (i.e. 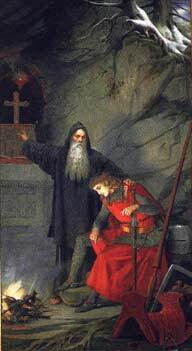 Gurnemanz) and Parzival in one scene, at the hermit cell, and led from there with omission of the events which intervene in Wolfram's poem directly to the Grail castle and the healing of Amfortas. The Holy Spear, the Christ-lance, which first appears only in a note following the Munich Prose Draft of 1865, was missing from the Zürich draft. Perhaps the healing was effected as in Wolfram, by Parzival asking the compassionate question about the suffering of the king. So the third act consolidated the action of Wolfram's Book 9 with details from Books 15-16 (appointment of Parzival to the office of king and introduction into the Grail castle) to produce an impressive dramatic account in two scenes. he Grail, which already appears in Lohengrin as a vessel of wondrous power , was interpreted by Wagner in accordance with the French romances, whose contents had been communicated by Simrock and San Marte, as the chalice of the Last Supper, in which Joseph of Arimathea caught the blood of the Saviour at the cross, not as Wolfram's magic stone. From the outset the Master went beyond and around Wolfram for the sake of clarity and descriptiveness. By concentrating on that which he found to be significant and important, and by leaving out the wonderful extravagances of Wolfram's imagination, Wagner achieved a poetic form that was concise and strong. Left: Parzival at the cell of the hermit Trevrizent, in this painting from Ludwig's castle of Neuschwanstein. he simplifications of the third act affected the first act (corresponding to Wolfram's Book 5), the first visit by Parzival to the Grail castle. Here too the act was divided into two main scenes: the first based around Amfortas taking a soothing bath in the holy lake (not fishing as in Wolfram! see Parzival 491, 6)3 and with the Grail ceremony in the temple. With the view of the Grail as a vessel containing the holy blood, the solemn ceremony was given a chalice as in a church service. The old squire (Gurnemanz, who had merged with the hermit Trevrizent of the third act into one character), Amfortas and the marvellously wild Grail messenger carried the action. The Grail messenger was present, cowering in a corner, in the painful scene with Amfortas and stared with a strangely inquisitive look, sphinx-like at Parzival. The compression to the drama prevented a direct representation of the forest life of the young Parzival (Wolfram's Book 3), particularly since the young Siegfried already contained such a picture on the beauty of which Wagner could scarcely improve. In the drama Parzival enters the domain of the Grail as a fool, in the epic as a knight. He plays the fool with Wolfram earlier, at the court of King Arthur. In the drama effective contrasts resulted from this compression: the fool in the first act, the knight in the third act. Particular scenes from Parzival's youth , e.g. the meeting in the forest of the boy with the "shining men", the knights, are introduced into his first act dialogue with the old squire. or the second act Wagner diverged more freely from Wolfram, choosing as the scene of the action the magic castle of Klingsor with the seductive woman, contents of Wolfram's books 10-13. The adventures of Gawain were transferred to Parzival and thus a contrast, unknown to Wolfram, was established between the Grail castle and Klingsor's castle of wonders. In Wolfram the centre of the action here is the beautiful Orgeluse, whose charms no knight (with the single exception of Parzival) can resist, in whose service Anfortas is wounded by the poisoned spear. Originally Wagner's Zürich draft kept distinct the three women described by Wolfram: the wild Grail messenger (Kundry) in the first act, Orgeluse in the second act, Sigune in third act. Only in the letters to Mathilde Wesendonk of 2 March 1859 and 1 August 1860 does Kundry become the world-demonic woman . The rebirth teachings that Wagner addressed in the Buddha-drama that he sketched in 1856 had an influence on the later development, although certainly not during the early development, of the Kundry figure. Another idea came from Wolfram, in which (318, 24)4 the Grail messenger Kundry appears again in the magic castle, where another Kundry, the beautiful sister of Gawain (334, 20)5 is held captive. In Wolfram's poem however these characters have nothing in common except the name. 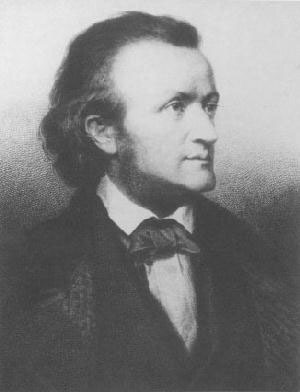 Thus one discovers some threads which lead from scattered places in Wolfram's poem to the drama, which were hardly present in the Zürich draft but which occurred to Wagner when he returned to the poem. Thus e.g. Kundry's call to Parsifal in the second act originates from a meeting of the fool with his cousin Sigune (140, 16)6 in which she reveals the name that he had forgotten, and her curse on him from the Grail messenger's curse in Book 6 (315, 20)7. Right: A dark-skinned Condrie, as Grail messenger, curses Parzival at the court of King Arthur, in another painting from Neuschwanstein. few images from Wolfram's poem stuck in Wagner's memory, from which be was able to outline immediately the entire drama in three acts on the "Good Friday" in 1857. How reliably Wagner's memory held after several years is shown by the letter to Uhlig of November 1851, where Wagner had asked for the Völsungasaga from the Dresden library in order to complete the poem of the Valkyrie but almost immediately recognized that he did not need this source after all. 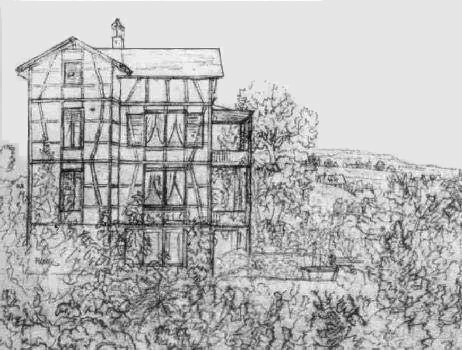 Just as little as he needed the Marienbad draft of 1845, which Frau Wesendonk sent him on 25 December 1861 to Paris, to complete the poem of the Meistersinger. With amazing fidelity he recalled the contents of Wolfram's Parzival, in order to compress that content, in the mysterious instant of poetic conception, into three climactic situations of violent intensity . chopenhauer had expressed similar thoughts: boundless compassion with all living natures is the firmest and surest guarantee of morality... The moral incentive advanced by me as the genuine, is further confirmed by the fact that the animals are also taken under its protection. In other European systems of morality they are badly provided for, which is most inexcusable... Since compassion for animals is so intimately associated with goodness of character, it may be confidently asserted that whoever is cruel to animals cannot be a good man... However the quality of the heart exists in a basic, universal compassion with everything that lives, although firstly with humans. arsifal in its definitive shape is the tragedy of compassion, the ethical basis of world redemption. In his last writings, as is well-known, Wagner advocated a religion of compassion. We will have to discuss this idea in the action of the drama in more detail. For the present it is enough to say that already in the original version, in the Zürich draft of the Parzival-drama, this ethical basic idea would have been clearly and certainly expressed. With the spear-wound and probably still another too -- in his heart -- the wretched man knows of no other longing in his terrible pain than the longing to die; in order to attain this supreme solace, he demands repeatedly to be allowed a glimpse of the Grail in the hope that it might at least close his wounds, for everything else is useless, nothing - nothing can help him; but the Grail can give him one thing only, which is precisely that he cannot die; its very sight increases his torments by conferring immortality upon them. The Grail, according to my own interpretation, is the goblet used at the Last Supper, in which Joseph of Arimathea caught the Saviour's blood on the Cross. What terrible significance the connection between Anfortas and this particular chalice now acquires; he, infected by the same wound as was dealt him by a rival's spear in a passionate love-intrigue, -- his only solace lies in the benediction of the blood that once flowed from the Saviour's own, similar, spear-wound as He languished upon the Cross, world-renouncing, world-redeeming and world-suffering! Blood for blood, wound for wound -- but what a gulf between the blood of the one and that of the other, between the one wound and the other! Wholly enraptured, he is all devotion and all ecstacy at the miraculous proximity of the chalice which glows red in its gentle, blissful radiance, pouring out new life -- so that death cannot come near him! He lives, lives anew, and more terribly than ever the sinful wound flares up in him - His wound! His very devotions become a torment! Where is the end to it, where is redemption? The sufferings of humanity endlessly drawn out! -- Would he, in the madness of his despair, wish to turn away forever from the Grail and close his eyes to it? He would fain do so in order to die. But -- he himself was appointed Guardian of the Grail; and it was no blind, superficial power which appointed him, -- no! It was because he was so worthy, because there was no one who knew the Grail's miraculous power as profoundly and as intimately as he knew it, just as his whole soul now years, again and again, to behold the vision that destroys him in the very act of worship, vouchsafing both heavenly salvation and eternal damnation! I feel a very real admiration and sense of rapture at this splendid feature of Christian mythogenesis, which invented the most profound symbol that could ever have been invented as the content of the physical-spiritual kernel of any religion. Who does not shudder with a sense of the most touching and sublime emotion to hear that this same goblet, from which the Saviour drank as a last farewell to His disciples and in which the Redeemer's indestructible blood was caught and preserved, still exists, and that he who is pure in heart is destined to behold it and worship it himself. Incomparable! And then the double significance of this one vessel which also served as a chalice at the Last Supper, without doubt the most beautiful sacrament of Christian worship! Whence, also, the legend that the Grail (Sang Réal, whence San(ct) Gral) alone sustains the pious knights, vouchsafing them food and drink for their repasts. And then there is a further difficulty with Parzival. He is indispensably necessary as the redeemer for whom Anfortas longs: but if Anfortas is to be placed in his true and appropriate light, he will become of such immense tragic interest that it will be almost impossible to introduce a second focus of attention, and yet this focus of attention must centre upon Parzival if the latter is not simply to enter at the end as a deus ex machina who leaves us completely cold. Thus Parzival's development and the profound sublimity of his purification, although entirely predestined by his thoughtful and deeply compassionate nature, must again be brought into the foreground. But I cannot choose to work on such a broad scale as Wolfram was able to do: I have to compress everything into three climactic situations of violent intensity, so that the work's profound and ramified content emerges clearly and distinctly; for my art consists in working and representing things in this way. 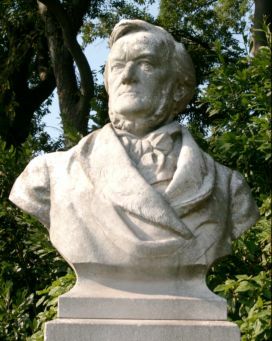 Above: A memorial bust of Richard Wagner, in Venice. rom these communications it appears that the scenerio of the Zürich draft was already quite developed and that it had much in common with the later poem, whilst in other elements it stayed closer to Wolfram's Parzival. 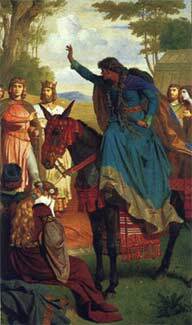 The three main figures were [by 1860] already present: Amfortas, Parzival, Kundry. In the Zürich draft Kundry as Grail messenger, in the sense that term is used by Wolfram, attends the communion celebration already in the first act, at the same time with Parzival, the stupid one. In the later poem [and in the 1865 Prose Draft] she first (in attendance on Parzival) enters the temple of the Grail, from which she was excluded as heathen 8 before, only after her baptism in the third act. As an old squire Gurnemanz has already appeared. On the other hand there is still no reference to Klingsor. As in Wolfram, at this stage it is the spear of a rival in a love-adventure that causes the wound of the Amfortas. The Holy spear, which is the lance with which Longinus wounded the Saviour in the side and which is kept beside the Grail as a relic, does not yet appear in the story. Between the wound of the king and that of the Saviour, however, a mystical connection had already been established. The author then goes on to consider the 1865 Munich Prose Draft. The reader might prefer to read it here. Footnote 1: A translation into English (or at least an approximation to English) can be found in Wm. Ashton Ellis' edition of the Prose Works, volume 3, pages 231-233. Footnote 2: Here Dr. Golther explicitly assumes that the 1857 draft closely followed Wolfram. He does not present any arguments to support this assumption. He implicitly assumes that no other source material (whether of recent acquaintance or, like Wolfram, remembered from his Dresden years) was influencing Wagner on that spring morning in 1857.
durch sîner sûren wunden gruft. to dispel the stench of his wound. die man gerne möhte schouwen. ich wil doch hînte drûffe sîn. who are a delight to see. a noble prize of highest love. I intend to be there tonight. zwuo sint alt, zwuo sint noch kint. who are entitled to wear crowns. Two of them old, two still children. The Cundrie mentioned here is "sweet Cundrie", sister of Gawain, and Itonje is their younger sister. Queen Sangive is their mother. Queen Arnive is the mother of King Arthur (the equivalent of Malory's Igraine). der nam ist rehte enmitten durch. dîn vater liez ir riuwe». your father left her sorrow." diu wærn iu beidiu tiure. and on your manly limbs. you would go begging for them! Footnote 8: An alternative reading is that Kundry has been excluded from the temple as a woman. The temple of the Grail is a male preserve, in which a community of men guard the feminine symbol of the Grail, and where masculine values prevail. Parsifal as the Victoriously Perfect admits the woman and by doing so restores balance to the community.